Der Gesetz Recht vnd Gerechtigkeit. Pictures of tanks advancing on Hama and demonstrations in that town of these last days. ‎”Syrian tanks storm the city of Hama” I read today and the mere name of that haunted town makes me shiver, as tens of thousands of people were massacred there in the year 1982 on orders of Assad Senior, the death toll ranges between 20 and 40 thousands. A genocide forgotten – some say – a political mass-murder would be a more apt classification. The movie below commemorates the 1982 ordeal of Hama in Syria. 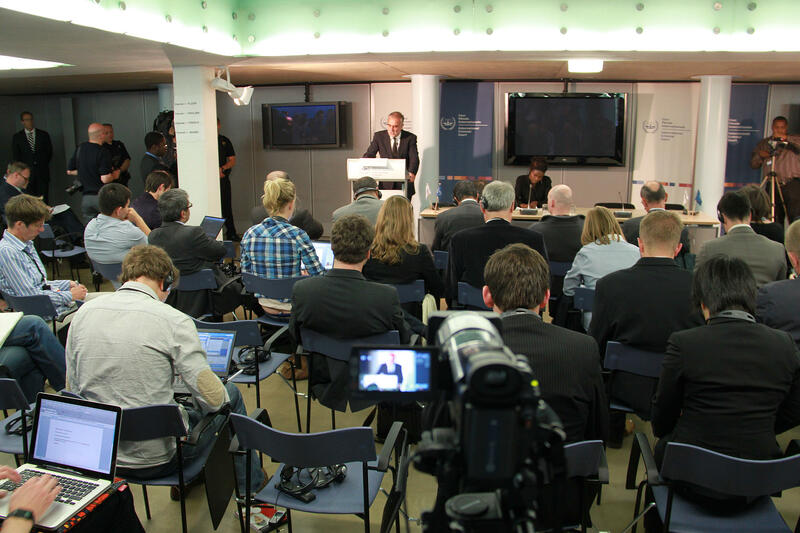 Infringements on human rights in Syria have been documented for decades by organisations like Amnesty International and Human Rights Watch. This has not led the ‘international community’ to take any serious action against the Assad regime. The Assad dynasty is a stabilising power in the region, as was the Egypt of Mubarak. The fate of Syrian citizens is judged as being less important than the Middle East Entente. Also the International Criminal Court in The Hague – sadly enough – is more lead by the geo-politics of its constituent states, than by the rule of international law. Whereas the UN Security Council asked the ICC to research whether the Libyan government should be indicted for its threats to the civilian population. No such actions have been taken against the Syrian government of Assad Junior. The balance of power in the Middle East is more important than the balance of international justice. 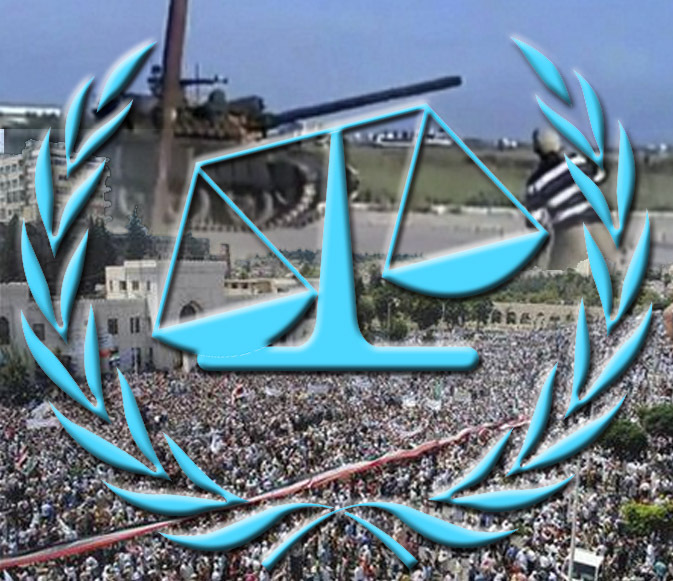 Or will the attack of tanks on demonstrating citizens of the town of Hama make the bascule of justice move to its proper position? Of the 139 states that have signed the Rome Statute of the International Criminal Court, 34 have not ratified the treaty, Syria is one of them. Flying NATO warrant for Gaddafi over Libyan desert. When a court orders an alleged killer to be arrested and it notices that someone else tries repeatedly to kill ‘their killer’…. it would issue also an arrest warrant for the murderer ‘in spe’ of the indicted. Sounds logical but we see today that the Prosecutor of the International Criminal Court fails to do so. He did not issue any public statement ordering the chiefs of NATO to stop their attempts at the life of someone who needs to face his judges here on earth. My Office has not requested the intervention of international forces to implement the arrest warrants. Should the Court issue them and the three individuals remain in Libya, Libyan authorities have the primary responsibility to arrest them. Libya is a member of the United Nations and it has the duty to abide by Security Council Resolution 1970. When the time comes, implementing the arrest warrants will be the most effective way to protect civilians under attack in Libya and elsewhere. As in any other criminal case, the execution of the warrants will have a deterrent impact for other leaders who are thinking of using violence to gain or retain power. …while the list of Libyan war criminals by the prosecutor of the International Criminal Court Luis Moreno-Ocampo keeps dwindling and until now only three suspects are mentioned by name: Muammar Gaddafi, his son Saif al-Islam and Gaddafi’s brother in law Abdullah Senussi. The deserted former head of the Libyan Secret Service and last Minister of Foreign Affairs Moussa Koussa (also spelled in the Western press as Musa Kusa), part of the regime till a few weeks ago, when he crossed the border of Tunis and was welcomed as a valuable informer for NATO in Great Britain, seems not to be on the list of the International Criminal Court. We now have a whole score of pro-active regime members who are defecting by telephone. This tactics seem to be much more effective than throwing big bombs from speedy airplanes onto buildings that are either empty or inhabited by people who were are the wrong place at the wrong moment. What to think about the British Chief of the Defence Staff General David Richards who called last Sunday for “widening targets in Libya” as NATO tries all it can to keep Gaddafi from being caught alive and being brought for the International Criminal Court in The Hague. All of this is also a show of force to help topple the tank based Assad family from power in Syria, in the near future. Political leaders must by now have received the message of the international legal community, that only in China it is allowed to use tanks against demonstrators. Both politics and justice in Africa and the Middle East seem to be in the hands of NATO generals, they take the initiative while parliaments have lost all control over this theatre of war. 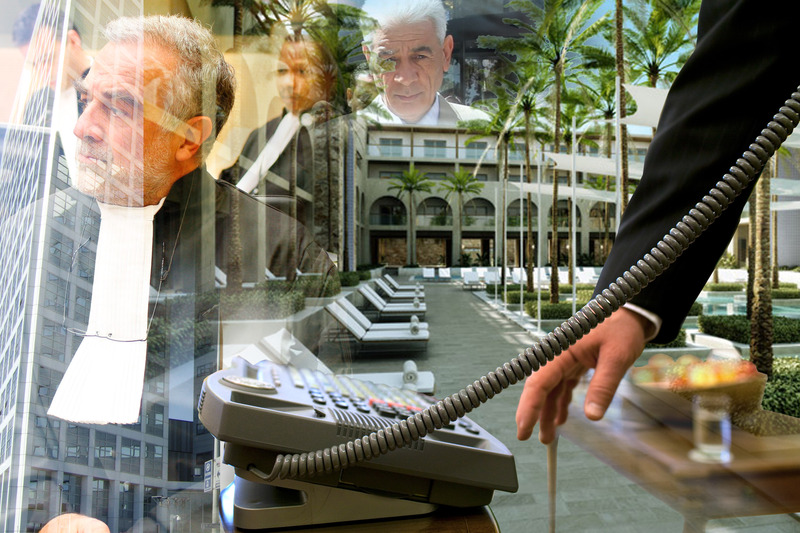 Happily the International Criminal Court in The Hague – that has no own police force to arrest indicted war criminals – still has a telephone line, to prove things can be done differently. Or, one musty believe that the members of Gaddafi’s claque and clique needed some bombs to rain next to their front doors before they would call The Hague, as if the downfall of the Gaddafi reign had not been imminent for many months already, without NATO airplanes. Why diplomatic forms of subversion have failed to be used to oust the regime of Gaddafi? Who does the body count in Libya irrespective on which side death occurs? Who are those Libyan army soldiers that are legitimate targets now? I read the army consists of 25.000 volunteers and 25.000 conscripts and that their equipment is rather outdated. So what chance they have against the ultra up to date NATO forces? NATO does not have smart bombs that can decide who to kill and who not, bombs that can distinguish between a conscript, a volunteer, a Gaddafi guard or an insurgent. Too many unanswered questions. I have always had a suspicion when ‘civilians’ are protected and soldiers are open for lawful slaughter. We need to widen our vision on such conflicts and develop new tactics for more peaceful methods of transition of power. NATO’s Collateral Tyrannicide: will it bring Justice and Peace? That is what “Resolution 1973″ of the Security Council in it’s 6498th meeting on March the 17th 2011 says. Who reads through the details sees: protection of civilians; No-fly zone’ ; enforcement of arms embargo; ban on flights; asset freeze; but nowhere is the option of disposal of the head of state, let alone targeting his life mentioned. On the contrary – in the same document – the Prosecutor of the International Court of Justice in The Hague is alerted about the possible targeting of the Libyan civilian population by its authorities, this in order to call them to justice. Our modern courts do not practice anymore justice on accused that are dead. In antiquity the slaying of a tyrant was seen as an honourable act, a self sacrifice for the public cause, but the institutional execution of murder by international associations of states seems to be of another order. One can not pretend to uphold a state of international justice on the one hand and order summary execution without trial of misbehaving heads of state at the other, because who will be the judge of such decisions? The same reasoning does apply to the execution of those who are labeled as terrorists. What Gaddafi, Bin Laden and Assad have in common is that they have been declared in public opinion as public enemies and as such in the political practice of today they stand almost no change to be brought to court alive and face their judges. They are on the informal 'hit list' of legal representatives of state coalitions, designated to die violently. Will that serve the cause of justice and peace? ‘Mission creep’ has become a household word in todays international politics: half a war is started on a quarter of evidence whipped up in ‘the news’ and those who may have a good historical insight in any of these turmoil areas are the last to be consulted, as diplomatic options are cast aside in haste and overridden by military solutions. Politicians – with their own national and international agenda – are even competing in proposing the military approach as faster and more efficient. What started of as a temporary interventions to prevent mass killings, pre-emptive strikes against the employment of mass murder weapons, and other direct threats against humanity, prove – on a longer term – to be operations that are more ‘problem makers’ than ‘problem solvers’. The military are saddled with practical questions diplomats were not able or not allowed to solve: is there a rational basis to decide who is going to be supported, who needs to be attacked, who to be protected and what about bloody revenge in the aftermath of a state collapse? Two years ago this question has also been raised in a thorough article by the scholar Shannon Brincat in the ‘Australian Journal of Legal Philosophy’ under the title “Legal Philosophy of Internationally Assisted Tyrannicide.” Brincat is not a lawyer but a political scientist and rightly focusses on the underlying historical principles of the practice of international law and tyrannicide as he looks back a few centuries and cites Gentili (1522-1608), Grotius (1583-1645) and Vattel (1714-1767) on the issue of acceptability of the killing of a tyrant, a person belonging to the classical legal category of ‘hostis humani generis’ (common enemies of mankind). Brincat shows the historical acceptance of ‘tyrannicide’ as a way to get rid of a despotic and cruel ruler abusing the public power. The legitimacy of a ruler was thought to be based on a common bond with his subjects. When a ruler failed to work for the welfare of all, the bond would be nilled and murder could be envisaged to put an end to tyranny. Murder of a tyrant has been often an act of a private citizen for the common good of his fellow citizens. In some cases it has been classified as ‘an act of self-defence’. 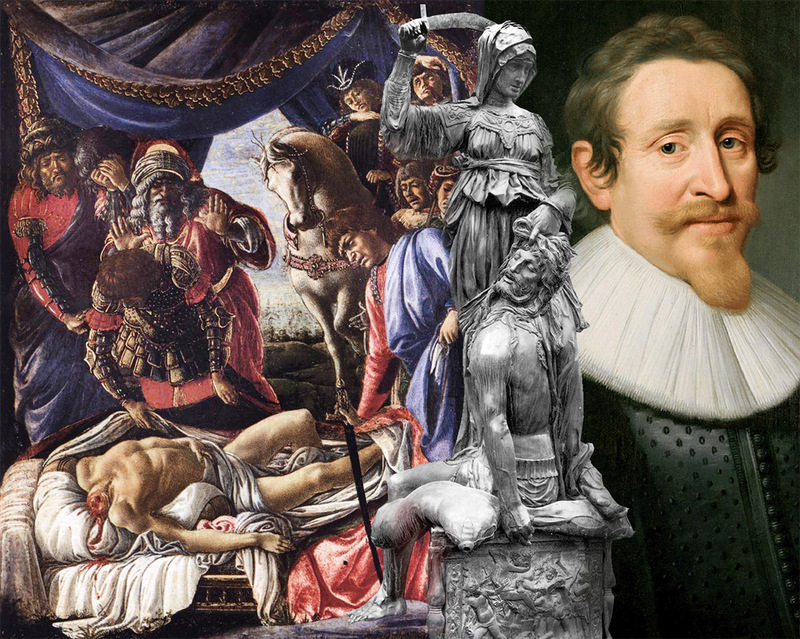 “It be lawful to kill him who is preparing to kill.” Hugo Grotius seen as the father of 'international law' in "On the Law of war and peace" (De Jure Belli ac Pacis; 1625. Book II, 10. ), self defence not only after an attack but also to prevent it. Grotius uses all kind of classical references to support this point. The killing of tyrants is deeply embedded in human history and has also a strong presence in European Renaissance art, whereby the biblical story in the Christian Old testament of Judith beheading Holofernes, an Assyrian general who is about to slaughter her besieged home town Betylua in Judea, is the most famous example. A gruesome deed, acted out by Judith as 'the hand of God'. Our forebears were not afraid of gruesome pictures as can be seen here in two of artistic renderings of this 'parable': 'The discovery of the murder of Holofernes' by Botticelli painted in 1472, and the sculpture by Donatello dramatising the same subject in 1460. The meaning of Donatello's sculpture in Firenze was an explicit political one, pointing to the liberty of the citizens to dispose of a tyrant if needed. The portrait to the right is of Grotius known by the Dutch as Hugo de Groot. The United Nations ‘New York Convention’ – as it is known – in full Prevention and Punishment of Crime Against Internationally Protected Persons, dating from 1973, does give protection to heads of states, ministers, diplomats and their family outside of their country, this to support international diplomacy, but does not speak about the attempts on the lives of these same persons within their own country. This omission creates a a window of opportunity for legal advisers to military commanders as to the repercussions to be feared when targeting heads of state and their governmental echelon at home. In the recent case of the alleged targeting of Gaddafi and his family by NATO, this can still be seen as a ‘hostile act of intervention in the internal affairs of a state’, but there are loopholes in the UN ‘Resolution 1973’. When an attack will be classified as an operation necessary to keep the forces of Gaddafi from attacking civilians, it suddenly is not illegal anymore. That the great leader or his family are hurt on the side is just “their” bad luck. Even when seated peacefully in his berber tent in an oasis next to a swimming pool, not Gaddafi himself but his nearby entourage with all kind of communication equipment busy in commanding operations, can still be marked as a legitimate military target and Gaddafi being just a collateral victim. When demonstrators change the labelling of a head of state this does not mean that the legal position of the person according to international law has been changed accordingly, there is still the process of law that needs "to investigate the alleged commission of war crimes" Press Release: 04.05.2011 of the Office of the Prosecutor of the International criminal Court in The Hague. When it comes to killing a strong barrier between the 'symbolic' and the 'real' needs to be put in place, if we want to avoid lynching and other forms of 'mob justice'. Heads of states – metamorphosed into tyrants or not – do not have international legal protection against attacks by other nations on their lives in their own country, as it has been thought obvious that local laws do protect them sufficiently, any constitution secures the safety of its head of state. A situation that brought President Ronald Reagan and his advisers to the cowboy tactics of “Operation El Dorado Canyon” in 1986, bombing the headquarters of Colonel Gaddafi in retaliation of the alleged Libyan support for several urban guerrilla actions in the period 1985-86, the latest one being a bomb attack on a dancing in West-Berlin in April 1986 (frequented by American soldiers; 3 death and 230 people injured). The number of people that died in the USA revenge bomb attack vary in different sources, from 15 to 60, among which an adopted daughter of Gaddafi (some say it was a post-mortum adoption for propaganda reasons). The American cowboy action was condemned by many countries and lead to a resolution in the General Assembly of the United Nations (79 in favour, 28 against, 33 abstentions). There was also a condemning ‘Declaration of the Assembly of Heads of State and Government of the Organization of African Unity’. 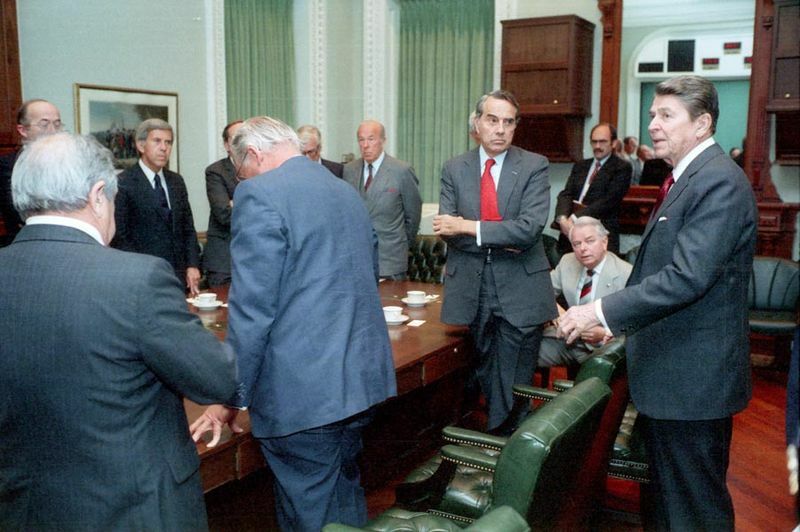 The U.S. President Ronald Reagan meeting with bipartisan members of the U.S. Congress to discuss the air strike on Libya ("Operation El Dorado Canyon") in Room 208 of the Old Executive office building, 14 April 1986. At the other end of the international juridical spectrum are ‘the people’, the whole population, and how they are protected by international law against their own government when it turns against them. They are not protected, we all know it, as the principle of our international community in its actual form, the United Nations, is based on its Charter that defines the association of sovereign states as the most basic principle. Any intrusion of this sovereignty of an existing government by an outer force can be labelled as ‘intervention in internal affairs’. There are of course, since the 1948 ‘Convention on the Prevention and Punishment of the Crime of Genocide…’, all kind of mechanism to protect human rights and human lives, but the enforcement of these rights remain problematic. The Genocide Convention itself is limited by its origin to prevent repetition of the racial based extermination policy of the Nazis and has proven useless when it came to mass killings with political or ‘social class’ motives be it in China , Cambodia, or elsewhere. The principle of the right to ‘self defence’ of individuals against an attacker is seen as customary and has found its way in all national laws, though many persons or groups that have been attacked by adversaries – be they local or national – and defended themselves, have found themselves categorised and treated as insurgents and outlaws by their local government. The right of self-defence has been purported to states as sovereign entities also and laid down in international law, be it in a limited form, as the arbiter of inter state conflicts, the Security Council of the United Nations, needs to be alarmed and once they have undertaken measures this self-defence right should not anymore be practiced. Some states do see ‘anticipatory self-defence’ as a statutory right and greatly widen its interpretation, like the ‘pre-emptive strike against terrorism strategy of US President George Bush. The impotence of the UN Security Council, its constant failure to act swiftly, its awkward system of five big states that can pronounce a veto over any proposal, is mentioned as the main reason why the idea of “peaceful settlement” of conflicts and the internationally controlled used of force by the United Nations constantly fails. 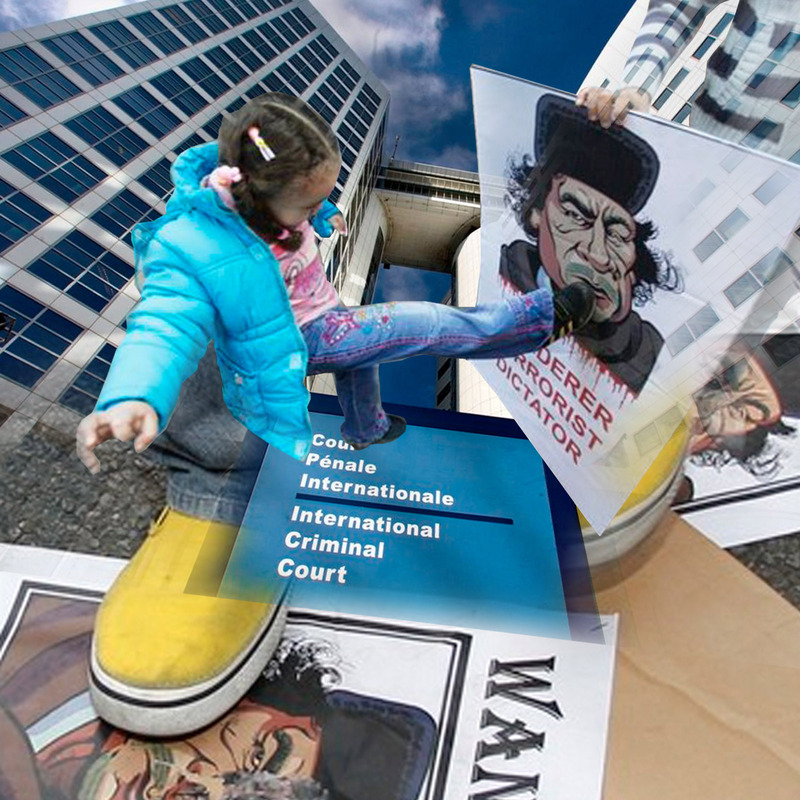 The right to self-defence may thus – by some states – be put above international law. At the time of the writing of the UN Charter international conflicts were solely seen as between states, but the non-state based phenomenon of international terrorism have altered that view. Does article 51 of the UN Charter also apply to non-state actors like al-Qaeda and when can one state be hold responsible for such non-state terrorist actors and can the principle of self-defence of a state be stretched to such an extend that a supposed host of terrorists can be attacked, either in reactive self-defence, or as a pre-emptive strike to prevent suspected future attacks? “We can not let our enemy strike first” or “We can not just wait and accept our fate like a sitting duck”, the arguments are known and do sound convincing at first. It is untenable for international law to permit one nation to attack another merely because it alone claims that a group operating in the other country is launching terrorist attacks against it. Such a rule would obliterate the prohibition against the use of force, as unsubstantiated claims by a single state would become the new legal predicate for the use of force. Those who urge a looser interpretation of Article 51 have yet to prescribe a viable method of ensuring that self-serving characterisations of facts are subject to some clear legal standard and international oversight. The Security Council issued in 2001 Resolution number 1368 as a reaction on the 9/11 terrorist attack: “to bring to justice the perpetrators.” Has justice been done now, since Osama Bin Laden has been shot dead in an undercover operation in Pakistan? A great nation like the United States of America at war with a non-nation like al-Qaeda, does that mean that on the one hand legality of ‘self defence’ based on article 51 of the UN Charter is used, while on the other no ‘rule or law of war’ seem to apply in the way this new kind of anti-terrorist battle is fought. It dawned on me that the supposed killing in battle of Osama Bin Laden, applauded worldwide as a victory of justice, has all the aspects of a classical act of ‘tyrannicide’. David George of Cambridge University published in 1988- in the year that al-Qaeda has been founded and was not yet widely known – an article entitled “Distinguishing Classical Tyrannicide from Modern Terrorism” in ‘The review of Politics’. In his summary is this concluding statement: “Terrorism, in short, is a form of tyranny of which tyrannicide is a negation.” George sees ‘terrorism’ and ‘tyrannicide’ as different antagonistic categories even when some of the assassinations perpetrated by modern terrorists are be seen – by some – as ‘self-denying acts for the public good’ (“one man’s terrorist is another man’s hero”). Bin Laden thus has become the emperor reigning a non-state imperium, whose death has liberated us from a cruel reign. US Attorney General Eric Holder speaking to the Senate Judiciary Committee on May 4th. said it was “an act of national self-defense” and “lawful.” Tyrannicide as an act of state self-defence? The tyrant killed in battle ending his unjust cause. In the case of Bin Laden one can hardly speak about a pre-emptive strike or ‘bringing someone to justice’, though the distinction between “Enemy Killed In Battle” and ‘summary execution‘ has – in practice – always been hard to make. The internationally approved rules do in no way allow a killing on the spot without judgement. The Geneva Convention of 1977 has a special paragraph forbidding it. “Every human being has the inherent right to life. This right shall be protected by law. No man shall be deprived of his life arbitrarily.” “[The Death] penalty can only be carried out pursuant to a final judgment rendered by a competent court” – ICCPR Articles 6.1 and 6.2. 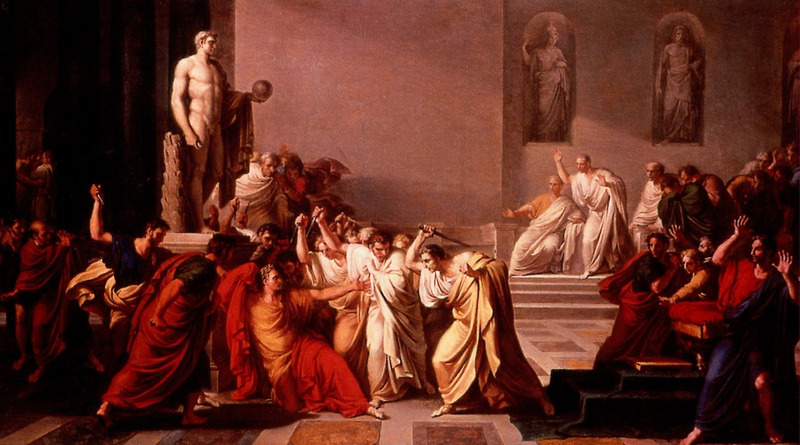 One of the most classical cases of tyrannicide is by a group of senators, jointly stabbing emperor Julius Caesar to death in the hall of the Senate. It is more an example of a ‘preemptive strike’ than an execution or revenge. The royal ambitions and proposed absolute rule of the ‘dictator perpetuo’ of the Republic of Rome, had to be halted. The conspirators abandon the corpse of Caesar on the spot where he has been killed and ran through the streets of Rome shouting “People of Rome, we are once again free!.” Not many responded and curious enough the fact that they left the body of Caesar was also to their disadvantage as it became a symbol for his followers later. The dropping of the body of Bin Laden right after his violent death may point to some classicists on the team preparing the operation in Pakistan. The assassination of Julius Caesar in 44 BCA here in an eighteenth century depiction of the the Italian painter Vincenzo Camuccini was a joint undertaking of a group of noblemen having the position of senators, who were fearing loss of their influence, something they saw a congruent with the safeguard of the liberties and influence of the people in the politics of the Republic of Rome. It set a series of events in motion that ended in civil war and the destruction of the same 'republic' they intended to safe. The centralising of power in the hands of one man as initiated by Caesar became after all practice in the later Roman Empire. Strangely - till this day - the assassination of Caesar is proposed as a successful prominent example of tyrannicide. Humanitarian intervention by other states or international associations of states may be the only way to alter an unbearable state of suffering of main parts of a population, but however noble the incentive, practice may prove to be different in many cases. Imposed change of regime from the outside, invasion to establish democracy, we have seen how such undertakings can develop in yet another human disaster in Somalia, Iraq and Afghanistan. The question remains if imposed change of regime, is aimed just at a dictator or a set of rulers, or if it is ‘the system of government’ which is targeted. Who is to judge and on what premises? Brincat mentions recent proposals for possible legal endorsement – in special cases – of the act of tyrannicide, in order to halt extreme suffering of a population, and he also notes its drawbacks. Is that not, what we observe these days? Who makes the so called ‘tyrant hit list’, who will be on it? Who will have enough power to execute it? What about all those who do not agree with such irrevocable acts? High technology aerial attacks on a head of state – or premises that are felt to be symbolic for the nation’s proud – by an outside force can also have a counter effect of rallying a nation around a national leader in demise, like it was the case after the NATO bombardments on Serbia in 1999 and the increase of support it created for President Slobodan Milošević, who could play out his new role as a victim of NATO aggression. It is not surprising that till this day this NATO bombardment, that was meant to protect the Albanians in Kosovo, is not forgotten in Serbia and remains a political rallying point for ultra nationalists like the Serbian ‘Radical Party’ of Vojislav Seselj (who is on trial at the Yugoslav Court in the Hague) a party who staged a pro-Gaddafi deomonstration in Belgrade on March 27th this year. Left: March 20 demonstration outside the compound of Gaddafi in Tripoli say to form a human shield to protect their leader against attacks of Coalition forces. 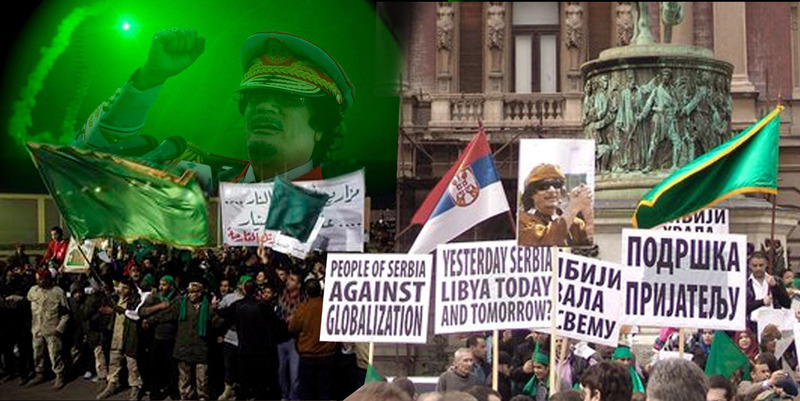 Right: Pro-Gaddafi demonstration in front of the Belgrade House of Parliament by Serbian ultra nationalists on March 27th. Some may call these demonstrators blinded zealots following the wrong cause, but one should consider that aerial attacks by foreign military forces will create antagonistic feeling for the powers throwing their bombs in broad layers of the population of a country suffering from it. 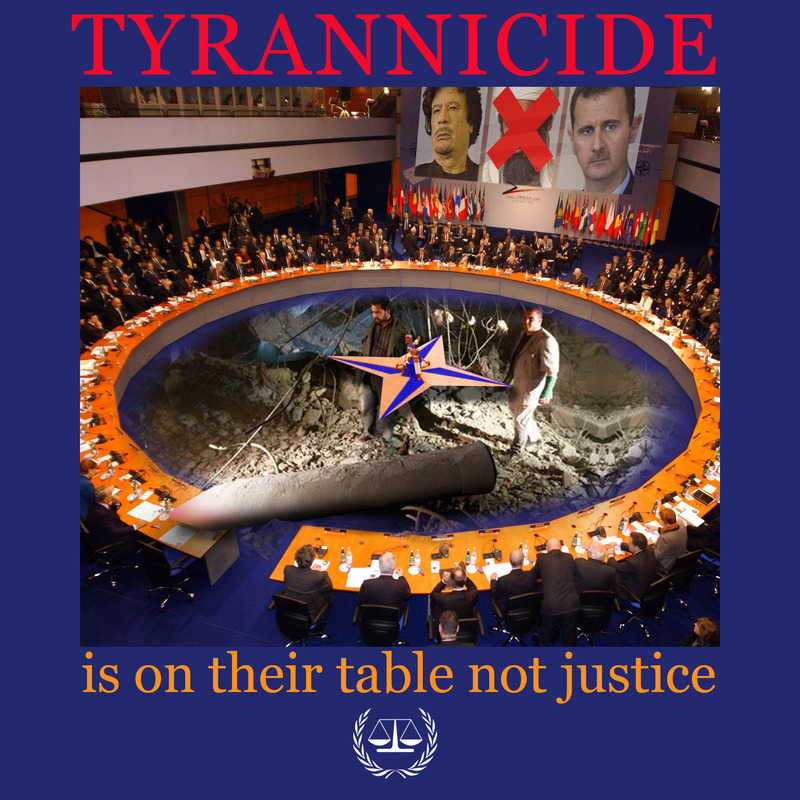 There are other aspects against the act of ‘tyrannicide’ especially when arranged or perpetrated from the outside, by other nations and other interest groups (like multinationals), not part of the nation that suffers tyranny. It distorts the social relations of a society – already in turmoil – with a foreign element which tends to be outside the scope of control of the population in question. It hinders the social revolution, apparently on its way. In the process of shifting of power it puts its weight only on one scale and thus disfavours genuine equalitarian forms of change. It also puts too much emphasis on ‘the one supreme leader’ whereas each tyrant is a complex social system of alliances, with many collaborators that will be all too happy that the head of the tyrant is cut while the social body of the tyrant may life on for quiet a while or never vanish. We should be aware that there is no great difference between ‘tyrannicide’ and ‘revenge judgement’. The hurried execution of the Rumanian dictator Ceausescu and his wife and the speedy trial and hanging of Saddam Hussein and only a selected group of his associates, are examples to bear in mind. When we think about long lived regimes like the one of Saddam Hussein, the Assad family and Gaddafi, there must be all kind of entangled social layers related in many ways to the ruling system. For such societies to reassess themselves is a cumbersome and long process and the concept of ‘Voluntary Servitude’ as formulated by Etienne de la Boétie (1530-1563) already centuries ago, must be born in mind. The text is also known in French as “Le Contr’un” which translates in English as the AntiDictator. Any usurper of power needs enough willing people to make him the ruler he is. A society must come to recognize how this process of mental and physical enslavement took place in order to find the right remedies to heal its historical wounds. In September 2006 Gaddafi was celebrated as the 'knight of 40 years of Green Revolution'. A year later the habitual commemorative series of stamps was published "The 41st Anniversary of the September Revolution" by the Great Socialist People's Libyan Arab Jamahiriya"; Jamahiriya meaning "the state of the masses." . As with the tyrants of the family Assad, Saddam Hussein (*) and Colonel Gaddafi, world leaders have been supportive of their regimes for decades for all kind of reasons: the stability of the Middle East and the position of Israel, a state opposing the Iran and its ambitions after the fall of the Western oriented Shah leading to indirect support of one of the most bloody post World War II wars, the one between Iraq and Iran. 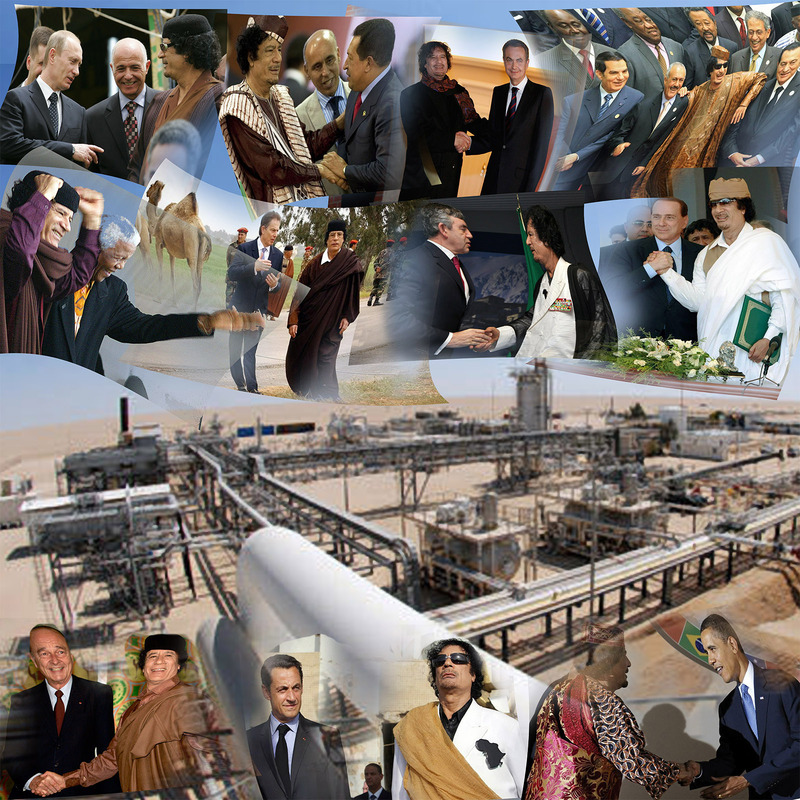 Other reasons are oil, gas and nuclear power contracts some of them signed only recently by the same political leaders of the Coalition Forces now involved in the military containment and overthrow of Gaddafi’s state. What about the economic interests colouring their vision? One can observe that shifts of power also imply shifts of political relationships, like a most recent visit of a trade mission of the People’s Republic of China to Cairo, after the fall of Mubarak. 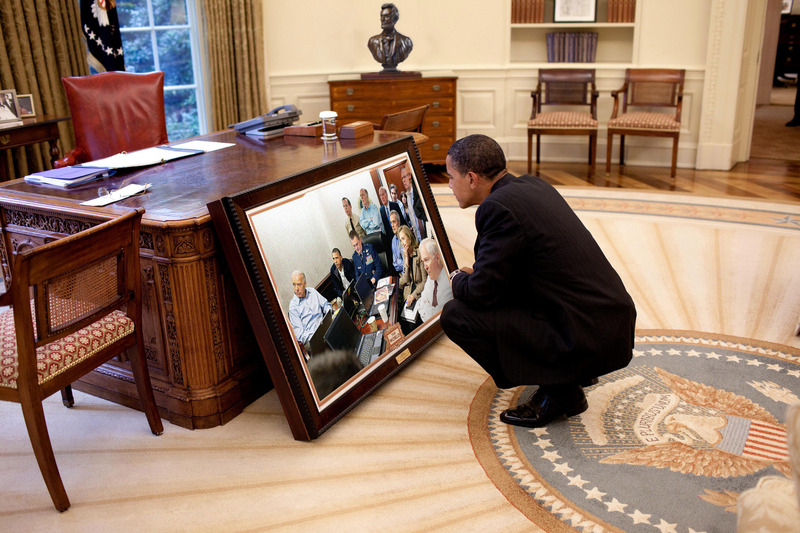 Pictures from the family albums of heads of state to remember meeting Colonel Gaddafi: Putin, Chavez, Zapatero, Zine El Abidine Ben Ali, Ali Abdullah Saleh, Hosni Mubarak, Mandela, Blair, Brown, Berlusconi, Chirac, Sarkozy, Obama. 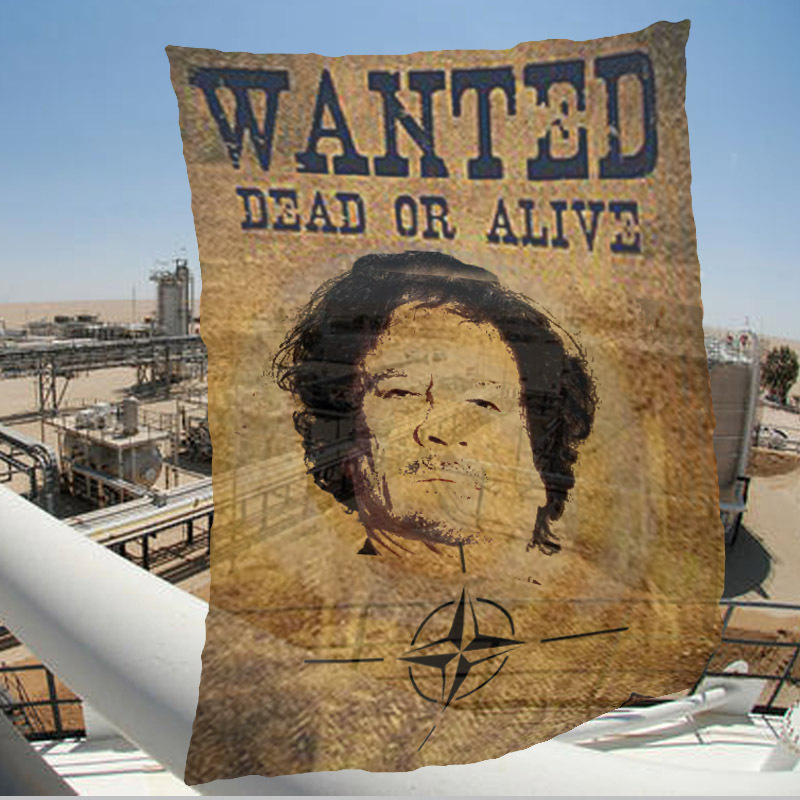 The choice for military force, the attempts at collateral killing of Gaddafi, leaves no space for the later appearance in any court – be it Libyan or International – of Gaddafi. Imagine this: Gaddafi taking the stage to defend himself, what would he say, what would he tell about his former powerful friends? Just the idea… better have him dead! Images of the process of Saddam Hussein come to mind of a judge hammering off his public statements. 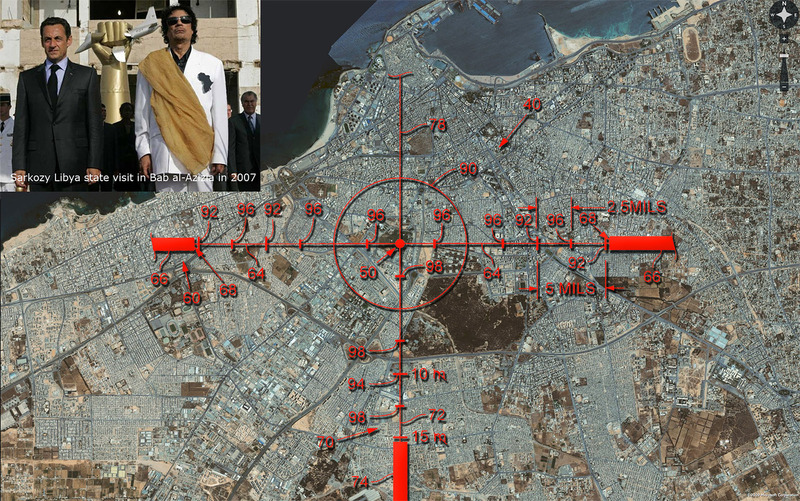 A simulated targeting view of the compound of Gaddafi in Tripoli. The inset shows Nicolas Sarkozy during his state visit to Libya in 2007 standing next to Gaddafi in front of the monument commemorating the bombardment ordered by USA President Ronal Reagan in 1986 of the same compound he is standing in. This year March Sarkozy has been involved in the bombardment of the same spot. 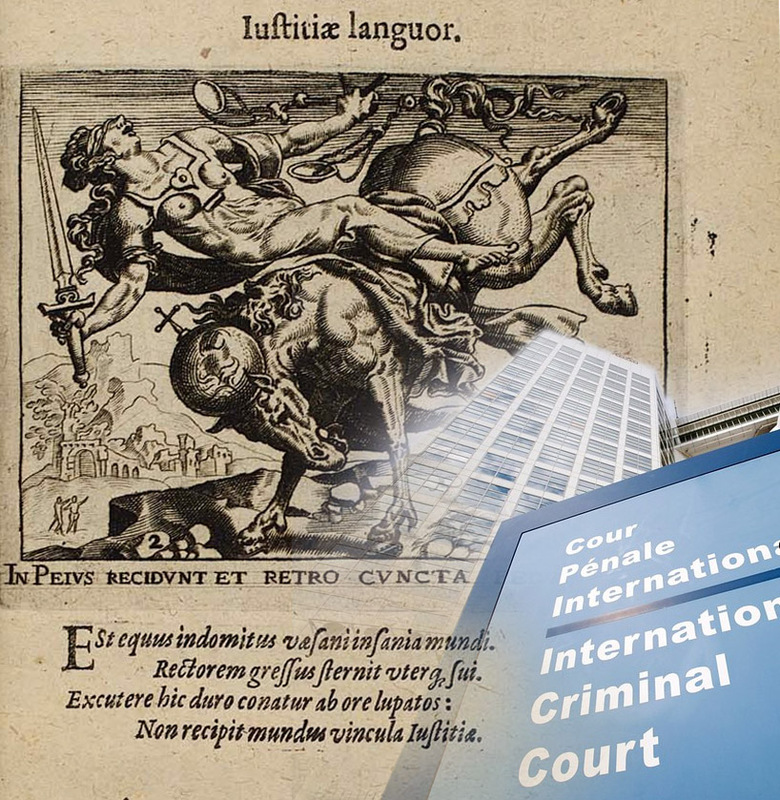 Are we ready yet for a real functioning of an International Criminal Court that prosecutes individuals and their crimes in an impartial fashion? A process of judgement that will create the space necessary for rebuilding in a nation that what has been destroyed, giving time to recreate a minimal common bond between the people and its government. On the international stage of politics many speak of human rights protection and the necessity of some form of democracy. In practice this is deliver through the use of high-tech military power. Are these the right means to such an end? Will it serve Libya now, Syria later? It is doubtful that long distance military force through the air, ‘Big Stick Policy’ of the 21st century, will help to establish peace. Many of the perpetrators that should be judged will be dead before they can face their judges, here on earth. 'Big Stick Policy' in American cartoons from 1902 Roosevelt to 2011 Obama. Roosevelt attributed the term 'big stick' he started to use in 1900 to an African proverb: "Speak softly and carry a big stick; you will go far."